When the evil Trade Federation plots to take over the peaceful planet of Naboo, Jedi warrior Qui-Gon Jinn and his apprentice Obi-Wan Kenobi embark on an amazing adventure to save the planet. With them on their journey is the young queen Amidala, Gungan outcast JarJar Binks, and the powerful Captain Panaka, who will all travel to the faraway planets of Tatooine and Coruscant in a futile attempt to save their world from Darth Sidious, leader of the Trade Federation, and Darth Maul, the strongest Dark Lord of the Sith to ever wield a lightsaber. 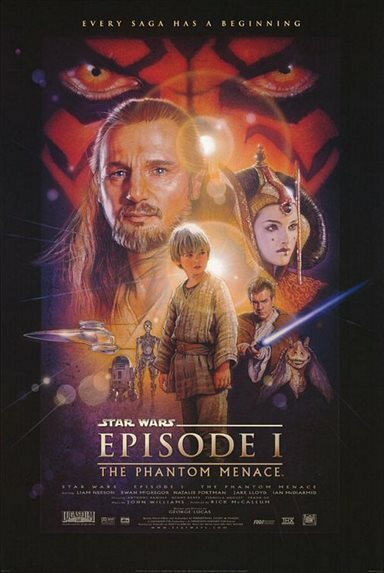 Download Star Wars: Episode I - The Phantom Menance in Digital HD from the iTunes store. Star Wars: Episode I - The Phantom Menance images are © 20th Century Fox. All Rights Reserved. There is nary a person alive today who hasn't heard of Star Wars or seen the influence it has had on culture. So to explain it to you seems unnecessary but for the sake of this article let's do so. Star Wars follows a group of resistance fighters who are trying to topple the regime of an evil emperor, at the same time a young farm boy eager to make his mark in the world discovers he is part of an ancient culture capable of tapping into a mystical energy that exists in the universe. The original movie aired in the late 70's and spawned two sequels titled The Empire Strikes Back and Return of the Jedi. The movies were a blockbuster success and made George Lucas (its creator) a household name. But many fans, for many years, waited for Mr. Lucas to return to that universe and map out the rise and fall of Anakin Skywalker, who would one day become Darth Vader. 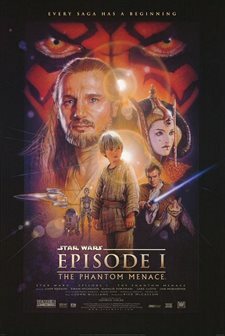 Finally near the end of the 90's the wait was over when the first of the prequel trilogy arrived in theaters titled Star Wars: The Phantom Menace. The movie went back a generation to a time when the Republic was still the major political force in the universe and the Jedi were the guardians of peace throughout the galaxy. The plot went something like this: A Jedi knight and his young pupil become mixed in a political battle over trading rights which is being secretly manipulated by a dark figure. The two Jedi wind up aiding two young children, one who is a poor boy from a backwater planet and another who is the leader of the people whose planet is being laid siege. With me so far? By the end of the film the young boy is recruited into the Jedi as an apprentice, or padawan, and the planet of Naboo is saved however the figure who manipulated this entire situation is never discovered and that lays the seeds for the sequel. Reaction to this film was mixed and many fans felt it did not do the series justice; this fan was one of those non-supporters. The movie just doesn't work on many levels; there is no clear villain, the over use of CGI in the film disconnects you from the whole experience and the performances are superbly underwhelming. At the risk of sounding like someone refusing to adapt to the "new", the old films were simply better, the characters were more fleshed out, performances were stronger, and the effects in the movie weren't completely reliant on CGI but instead made use of models which gave the effects scenes more substance. Even scenes with alien beings were better because the first film relied on live actors in make-up instead of forcing an actor to play against nothing and add in a CGI character later. Let's stop here because this could go on for a while, and the point of this article is to discuss the re-re-release of The Phantom Menace in theaters, now in 3D. 3D is a questionable format right now, some films benefit from it because they are engineered that way while others are made worse because 3D is just slapped on afterwards. The Phantom Menace is a good example of the latter; the film was clearly not made with the idea of 3D in mind so many of the scenes where it would be useful or fun wind up being neither. Suffice it to say, this film just doesn't work on many levels and putting it back in theaters now just seems wholly unnecessary especially considering the reaction to it. 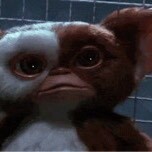 But it seems that releasing Star Wars in theaters is all that is left to Lucas at this point. It's not something to feel bad about, he made some great films besides Star Wars; go check out the Indiana Jones series or American Graffiti. Those are some classic films and the impact his effects studio has had on cinema in the 20th century is unparalleled. So in closing let's not be too upset over Star Wars, no matter how anyone feels about it, its impact on the world is clear and unchangeable. May the Force always be with us.